The Gatorade Company, in collaboration with USA TODAY High School Sports, today announced Conley Chinn as its 2015-16 Gatorade Mississippi Volleyball Player of the Year. 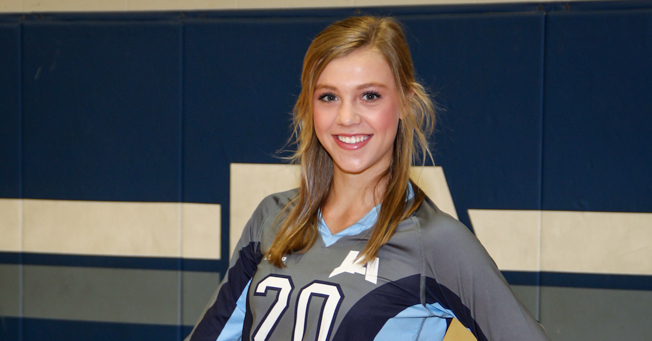 Chinn is the first Gatorade Mississippi Volleyball Player of the Year to be chosen from Jackson Academy. The award, which recognizes not only outstanding athletic excellence, but also high standards of academic achievement and exemplary character demonstrated on and off the field, distinguishes Chinn as Mississippi’s best high school volleyball player, said The Gatorade Company in a press release sent to JA this morning. Chinn joins an elite alumni association of past state award winners in 12 sports, including USA Volleyball players Kim Glass (2001-02, Horseshoe HS, Penn. ), Kim Willoughby (1998-99, 1999-00, Assumption HS, La.) and Ogonna Nnamani (1999-00, University HS, Ill). The 6-foot-1 junior middle blocker led the Raiders to a 35-3 record and the Mississippi Association of Independent Schools championship this past season. Chinn recorded 283 kills, 263 blocks, and 91 service aces. A member of the All-State Tournament Team each of the past two seasons, she is also a Clarion-Ledger First Team All-State selection. Chinn has maintained a 4.0 GPA in the classroom. Also a track and basketball standout, she has served on the student council and has volunteered locally on behalf of the Special Olympics and youth basketball programs. The Gatorade Player of the Year program annually recognizes one winner in the District of Columbia and each of the 50 states that sanction high school football, girls volleyball, boys and girls cross country, boys and girls basketball, boys and girls soccer, baseball, softball, and boys and girls track and field, and awards one National Player of the Year in each sport. The selection process is administered by the Gatorade high school sports leadership team in partnership with USA TODAY High School Sports, which work with top sport-specific experts and a media advisory board of accomplished, veteran prep sports journalists to determine the state winners in each sport. Chinn joins recent Gatorade Mississippi Volleyball Players of the Year Blake Mohler (2014-15, Ocean Springs High School), Brittany Corder (2013-14, Our Lady Academy), Breann Hedin (2012-13, Long Beach High School), Sarah Farmer (2011-12, Tupelo High School), Victoria Nutting (2010-11, Hancock High School), Alison Welch (2009-10, Olive Branch High School), Charquita Anderson (2008-09, Southaven High School), and Claire Franks (2007-08, Olive Branch High School) among the state’s list of former award winners. To keep up to date on the latest happenings, become a fan of Gatorade Player of the Year on Facebook and follow them on Twitter. For more on the Gatorade Player of the Year program, including nomination information, a complete list of past winners and the announcement of the Gatorade National Player of the Year, visit gatorade.com/poy.